One of the most common issues we are asked to help with when a client gets a new puppy is how to teach them to go to the toilet in one place, or learn to go outside. Let’s face it, it’s pretty hard to concentrate on much else or enjoy your new pup if this isn’t sorted out quickly. There are several things you can do up front to help your pup develop good toileting habits, and save your carpet! Let’s go through the basics. Firstly, understand that your young puppy has no idea that it’s not ok to go wherever he/she gets the urge. Like a little child, there will only be a few seconds between getting the “signal” to go and needing to release. Not only do they not understand yet that you have a special area for this, young pups won’t usually have enough self control to wait until they get to this designated area by themselves. In effect, you need to think about this as though they are a toddler with no nappy on. It’s totally unrealistic to give a young pup the run of the house while you are on the phone etc and then be surprised or annoyed when you discover they have weed somewhere inappropriate. Like parenting, the success of this process largely comes down to good management and supervision, not “training.” It is up to YOU to set things up properly, not your puppy. Provide ample opportunities for your pup to succeed. Regularly take your pup to an area where you want them to go to the toilet, especially when they first wake up and after eating and drinking. Outside of these times, we suggest that if you aren’t with your puppy and actively supervising, place your pup in a ‘success area’. This can be any area of your home that you effectively section off so that the pup has easy, quick access to the area you want them to learn to go to the toilet in. This could be a crate, a playpen, an outside area, an area of the house such as the hallway or the kitchen blocked off with a baby gate etc, and it needs to be small enough that they can successfully get to this toileting area on their own. Make sure you have provided them with a porous surface to go on, such as a puppy wee pad, some newspaper, or access to grass. Because dogs naturally mark their territory, pups will instinctively try to mark over the top of the scent of their own or another dog’s urine. It is therefore essential that you eliminate the smell of any urine in any area of your home that you don’t want the pup to go in so as to not confuse him to go there again. There are many good products you can buy to get rid of any smell if your pup goes in the wrong area, just make sure you remove it and not just cover it up with another smell! You want to program your pup to be like a homing pigeon! When he or she feels and recognises the signal in their brain that they need to go, you want them to beeline for a particular door or area every time. A hit and miss approach is definitely not your best angle here. This is why it is so important to initially set your home up for the pup to consistently achieve success in the first stages until they offer this behaviour. If your pup accidentally makes mistakes all over the place, they will mistakenly assume that the whole house is available as a toilet. You have about 3 seconds to react when you catch your pup going to the toilet for it to have any learning effect, whether positive or negative. If you miss this timeframe, you’re out of luck, try again next time. The concept of time-out and taking your pup over to where the mistake was made when you discover it to rub their nose in it etc just isn’t fair or even effective, as they simply don’t understand. Dogs live in the moment and need immediate feedback to link a behaviour with a consequence. If you catch them going in the right place, offer a calm and positive response. This can be a calm pat, a treat, verbal praise, a game or something similar. Similarly, if you catch your pup going in the “wrong” place, offer a calm but negative consequence immediately (within 3 seconds of the event), such as a growling tone of voice, a firm no!, a clap of your hands etc. After 3 seconds move on. If you follow these basic guidelines you should find your puppy will get the hang of things quickly. As they develop good toileting habits and adequate self control, you can relax the boundaries until they can be taken away altogether. If things regress, simply go back a few steps until you are again experiencing success and then slowly relax the boundaries. There is no set agenda for this, like kids, every dog is an individual. Unfortunately it is easy to confuse some dogs through overdoing the praise and affection, which can accidentally give them the idea that they are “top dog” around the place. This mostly occurs with slightly older puppies or dogs and can quickly lead to several problematic behaviours, one of which can be weeing in the house on purpose to send a message to the other pack members (you!) about whose house it is. If you suspect your dog is weeing inside the house for this reason, make sure there is healthy balance of rules and boundaries and consider removing some of the dog’s privileges for a short time to re-establish yourself. If you are having trouble, we advise getting help from a behaviourist who can give you a holistic assessment and get you back on track as quickly as possible. 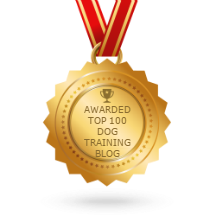 For the latest news, the best advice and puppy training tips, subscribe to our blog.